Hoka's marketing pitch: High level of support with oversize cushioning. Upper: Mesh, no-sew overlays+welds, stitched-on synthetic suede. Burrito tongue design. 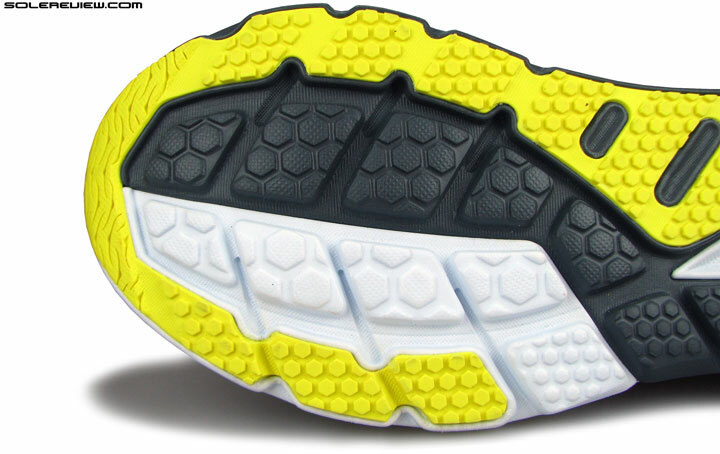 Midsole: Dual density foam; softer EVA over firmer RMAT midsole. 4 mm heel to toe offset. 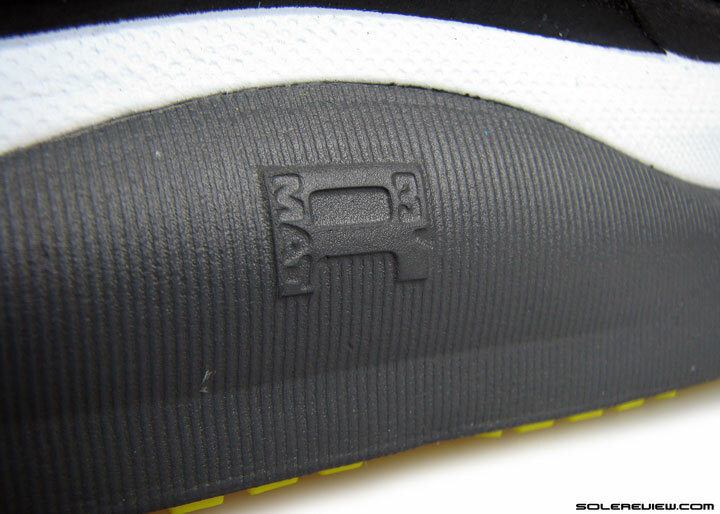 Outsole: Carbon rubber under heel and forefoot periphery, exposed EVA/RMAT foam. Weight: 323 gms/ 11.4 Oz for a half pair of US11/UK 10.5/EUR 45.3/CM 29. The Constant is the odd one in the Hoka herd. For what should come as a relief to many, the forefoot is actually spacious, in contrast to the norm of narrow fitting Hokas. Is the shoe perfect? No, but it has the signature Hoka ride, and comes served with a Burrito tongue. A Hoka which turns out to have ample splay room. Finally. A Hoka running shoe with a spacious forefoot which doesn’t feel like a bear hug. And the majority of Hoka loyalists know that this is a big deal; usually paired with their super cushy midsole is an upper hemming the forefoot in, with scant regard for foot anatomy. Nope, and exercising the option of pancake-flat Ortholites does not count as a remedy. So when you slide into the Hoka Constant, it is like moving up from a YMCA hostel bed to your own room with attached bath and room service. Or from flying cramped coach seats to premium economy with extra legroom. They say that change is the only constant. Here, Constant is the change. The Constant also happens to be a very different beast in Hoka’s maximally cushioned ecosystem. It strays away from the usual template; that of being another increasingly hard to distinguish (Vanquish vs. Conquest, Clifton vs. Odyssey, anyone?) oversize-midsoled model. This new 2015 release marks a few firsts for Hoka One One, for this shoe has a distinct spin on a couple of functional areas. It is a ‘support’ shoe – Hoka’s personal interpretation of a motion control or a support shoe, similar to the way the Adrenaline GTS does it for Brooks, or the Structure 18 for Nike. Consequently, that produces a ride behavior other than what one might have experienced on existing Hokas. That chasm of separation holds true for the Constant’s upper too. It goes down a different path than the Bondi/Conquest/Clifton, making use of design features hitherto unseen on rest of the product line-up, and hence affecting the final outcome with respect to upper fit. And what might those elements of newness be? 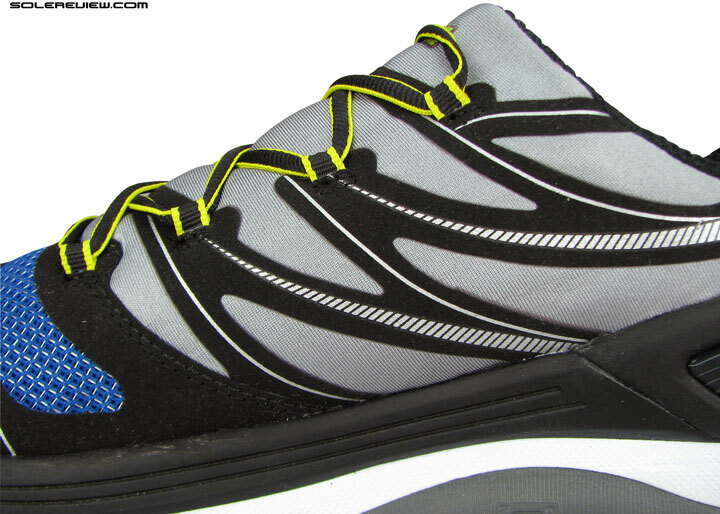 The only Hoka to feature a Burrito wrap tongue. Guacamole and chips, anyone? At first glance, the exterior might come across as standard Hoka. It’s only when you try to step inside the shoe that you realize that there’s a Burrito tongue. Meaning that the covering is shaped like one; an unbroken extension of the medial upper going over your foot, and ending in an open flap on the outer end. Can’t say we’ve come across many shoes served Mexican style; the last such model we reviewed was the Nike Lunarlaunch, though the tongue was the only thing it had in common with the Constant. 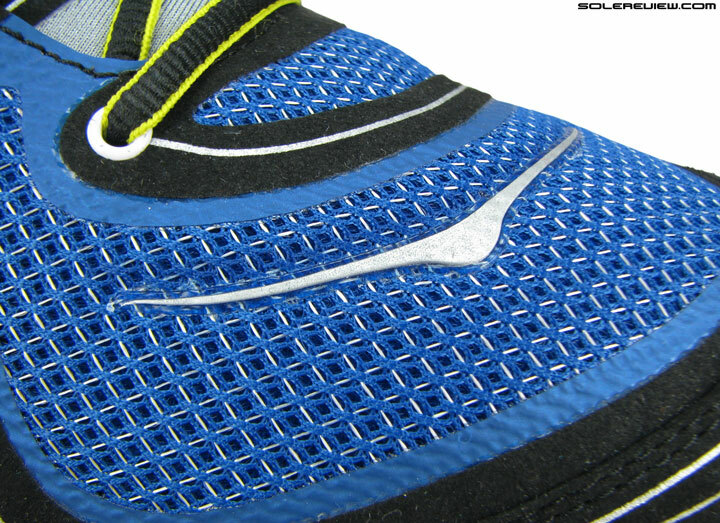 Standard closed mesh with a tacky execution of the Hoka bird logo. El cheapo heel strap. Not entirely useless, though. Helps with ingress. The look and feel of the upper material is standard Hoka. Closed mesh with shiny accents, no-sew synthetic leather, common collar and tongue lining pinched from the Bondi 4 and Vanquish, and the downmarket heel pull strap. We’ve yet to see a Hoka with an upper which feels premium and worthy of their high price tags, and it’s the same story on the $160 Constant too. The angular pattern cuts and screen print lines befits what would pass as a prototype sample for other older brands. Why does every Hoka upper look like it’s cut by hand? We don’t think that Hoka spends less money than other brands on making their uppers; it just feels that the brand does not pay enough attention to the aesthetic aspect of material selection, upper construction and execution. They should hire a few people with Brooks, New Balance or Nike experience – those brands really have a solid handle on the visual side of things. The default set of insole which comes with the Constant, Bondi and Vanquish. Molded lines give the reverse side some structure. And this is the additional (free) Ortholite sockliner. Not molded; die-cut with perforations. Inside, the Constant comes with an option of two footbeds. You have the default insole, which is the molded EVA foam type also supplied with the Bondi 4, Vanquish and Conquest. The other alternative is the Ortholite footbed of Crepe-like slimness, supposedly a panacea for an otherwise tight fitting upper. 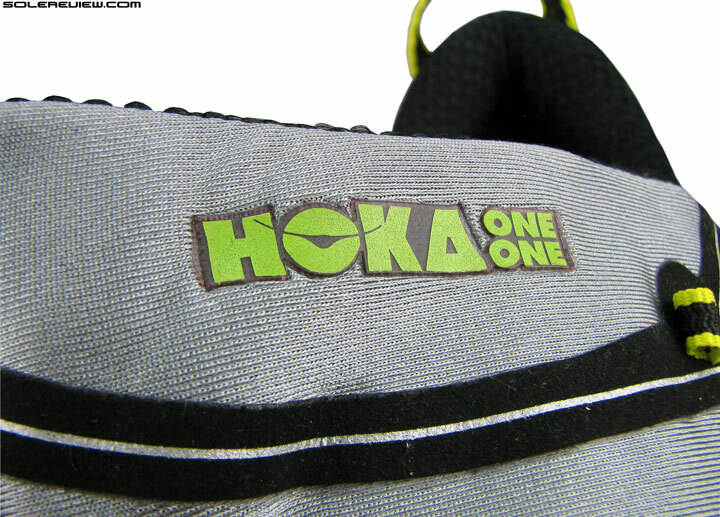 This is another area of oversight on Hoka’s part; why would one need this with the Constant? Since the shoe is already very roomy, the reduced thickness of the Ortholite does things to the upper fit which you don’t want it doing. The broad midsole tip and raised upper bumper adds vertical toe-box space. The toe bumper has a broad curve to it, and while that happens to be a doing of the midsole design, credit has to be given to the upper construction as well. When compared to, let’s say a Bondi 4 or Vanquish, the upper toe bumper molding is raised higher, and does not slope backwards over the foot like how the other two did. Plenty of height inside, even after you put the insole back in. And this is likely the first thing one will notice on the Constant. That it has a very spacious toe-box, so much so that it might end up in a purchase of a half size smaller. We could have very well managed with a US 10.5 instead of a 11. The vertical space is more than what you’ll encounter on other Hoka models, and the big toe sits comfortably below the raised ceiling without being rubbed or pressed down. The Constant’s apparent increase in upper forefoot girth hints at a modified last; there is a world of a difference in forefoot space when you stack the Constant against its siblings. The pressure which you normally get over the lateral (outer) forefoot is now non-existent, though the medial (inner) upper lining could have done with some additional refinement. 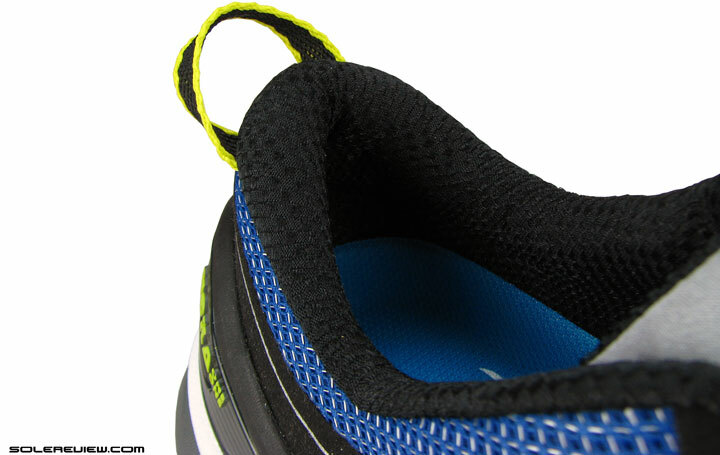 Lateral forefoot interior is smooth, medial (pictured) is not. 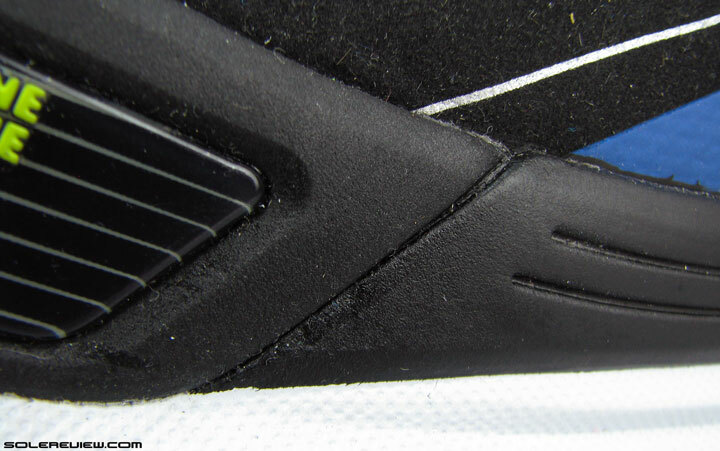 The black flap you see is the edge of the midfoot lining. 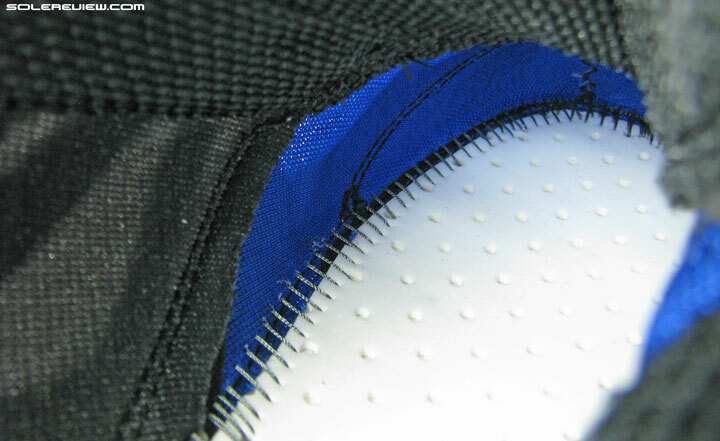 On the inner side of the medial forefoot, there is a seam where the midfoot lining overlays the forefoot mesh. While lateral forefoot has a smoother interior, the same feeling does not extend medially, where you feel some of the pressure applied by the seam. Since the forefoot is adequately roomy, the seam isn’t going to be an issue for the majority, but good to know – just in case you’re sensitive. The upper is all-over roomy, and not just in the forefoot. A noteworthy aspect about the Hoka Constant is that the extra room isn’t just in the forefoot, but spread over evenly along the shoe’s length. That means that the midfoot fit is relaxed, and the heel too. And this trait isn’t necessarily a positive. So how exactly does the upper midfoot fit feel like? 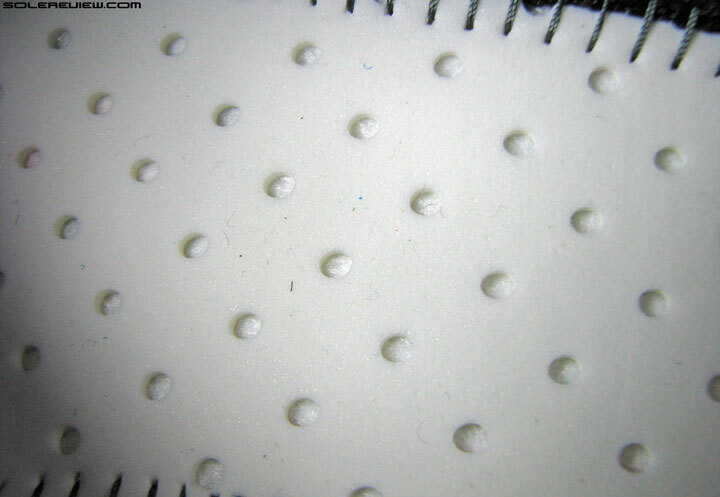 …and the outer face has round, metallic eyelets. 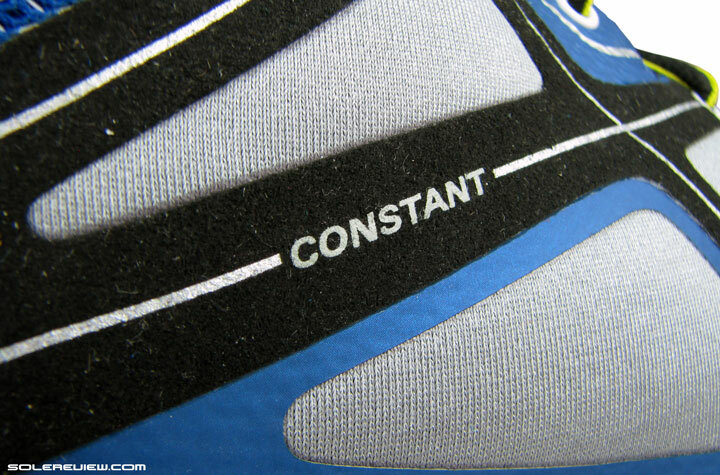 Before anything else, we’ll point out the Constant’s unique lacing system. Unusual in the sense that there are only four rows of lacing, and if that still does not mean anything to you, then know that the Bondi, Clifton and the Vanquish have seven rows of lacing. So yes, three lesser rows than regular shoes. 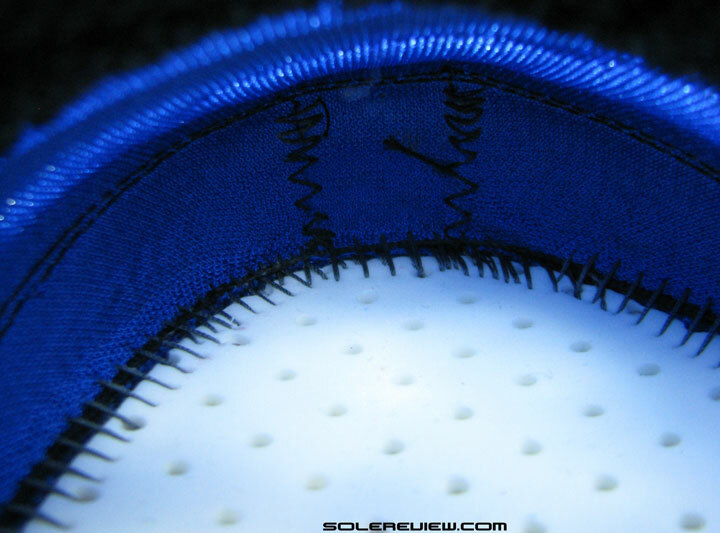 The eyelets are also uncommon in the way that the medial ones are regular round and metallic, while the medial side makes use of speed lacing loops. 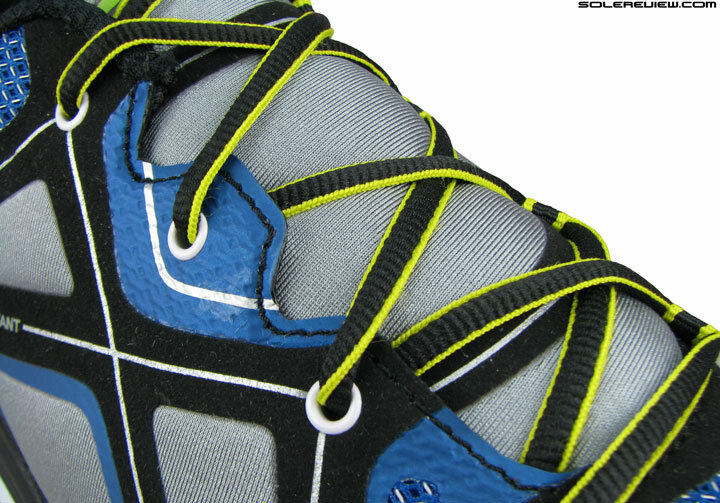 Limiting the lacing to just four rows reduces the efficacy of midfoot lockdown. There’s a discernible lack of confidence in the fit delivery, somewhat uncharacteristic of a ‘support’ shoe. But hey, can’t you increase the upper grip by simply cinching the laces tighter? Wide spacing between reduced number of lacing rows converts to a lower degree of lockdown. Lesser material between the medial speed loops and the foot creates pressure points if laced tight. You can, but it increases the top down lacing pressure. The rows are widely spaced – top to bottom and side to side, so it bears down on the foot with greater intensity than would a Hoka with more lacing rows and narrower spacing. Also take into account that the medial speed loops are situated on the Burrito tongue and not on a separate eye-stay (like how it is laterally). This means lesser material between top of the foot and lacing, and hence more pressure is transmitted through. The four lacing row(s) setup also implies that the last row is sacrificed, and that the heel lock lacing isn’t an available option. And more than any other Hoka, you feel the need for the last row. The midfoot lockdown is sub-par, and a lot of that spills over to the heel too. No slippage was experienced, but one is left wanting for a little more grip. On a related note, the laces tend to come undone in absence of a strong knot. 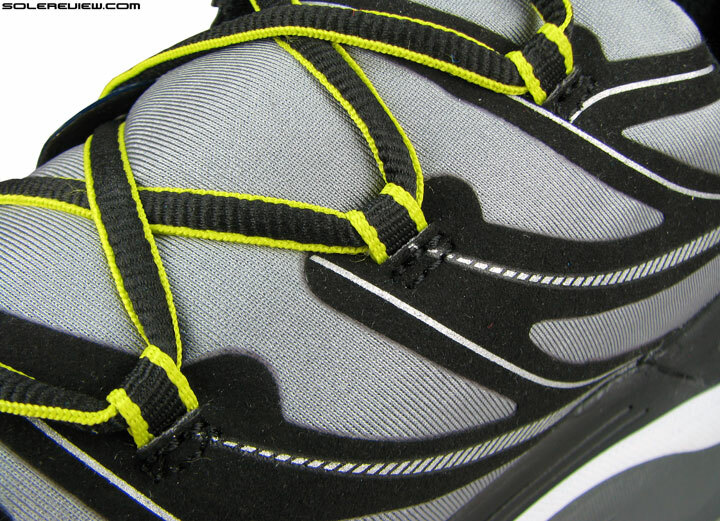 While not a deal breaker, this type of lacing is out of place on footwear line oriented towards long distance use. Even the Bondi 4 uses the same laces. There’s no synthetic overlaying over the tongue flap, so it feels nice and soft right out of the box. The upper portion of the collar is free from folded synthetics too. Good. The novel approach to the Constant’s construction surely has its positives. The tongue flap does not have a synthetic leather overlay, and the heel collar edges are kept free of layering – for the most part. So the Constant just feels much softer around the tongue and heel area – in other words, it has a better out of the box feeling than say, a Vanquish or Bondi 4. The Bondi’s collar edges (medially) feel like they’re rising up on the foot, an area which needs some time breaking-in. The Constant, with its softer construction, ends up being easier on the foot very early in its life. We’re left with mixed feelings on the Hoka’s upper fit. On one hand, the extra room in the forefoot is a refreshing change from how Hoka’s usually tend to be. On the flip side, the heel and midfoot feel out of their depth when it comes to securing the foot. This behavior is passable on flat roads, but throw some gradient in, and some forward foot slide comes into the picture. 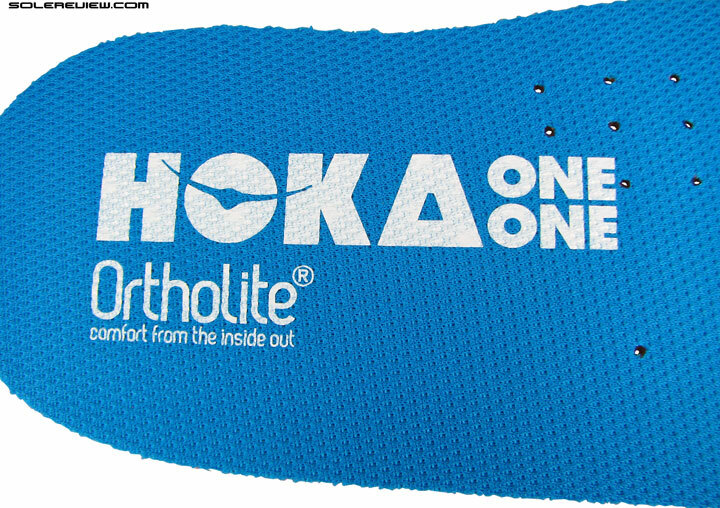 Want to pop in your own set of Orthoses over the swiss-cheese lasting? In the Hoka world, the Constant is probably the only shoe which can comfortably accommodate a thicker insole. The silver lining is that the Constant is perhaps one of the few Hoka models which can accommodate that aftermarket Superfeet or Sorbothane, as there is plenty of interior space to do so. That said, we certainly do not recommend swapping the standard EVA insole with the thin Ortholite one, unless you have feet of gargantuan proportions. Using the paper thin Ortholite makes the shoe super roomy, and you’ll have to tighten laces till the tongue crumples like a soggy Burrito – left for a few hours in a take-away box. Not much air passes through, unlike the breathable Clifton. The Hoka Constant’s upper is also the kind where ventilation in short supply, and this is appreciated when running in colder climes. When it’s warm, then this isn’t the shoe to go long distance in. If you don’t mind the difference in ride character vs. a Constant, consider the Hoka Clifton 2. Which is basically the same as C-1, except for the padded tongue, Ortholite insole and some updates on the outer upper. This is an oversize midsole. In what might sound absolutely ridiculous, this platform is the ‘middle ground’ as far as Hoka is concerned. All of this is proverbially bolted on to an ‘oversize’ midsole, which in this case happens to translate into stack heights of 30 mm heel and 26 mm forefoot. 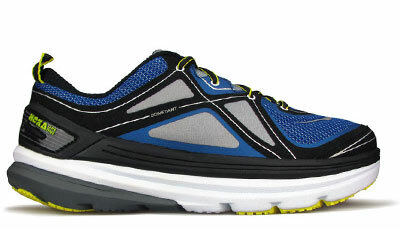 This is one rung lower than Hoka’s maximally cushioned, ‘ultrasize’ category, notably the Bondi 4 (33m heel) and its ilk. The point we’re trying to make here is that the Constant occupies a spot on the median of Hoka’s cushioning tiers, being neither too minimal like the Huaka nor too plumped up like the Bondi. The Constant takes a different path to achieving ‘stability’. Somewhat Beast 14 forefoot like; that dual density split. One thing we like about the Constant – and that’s a subjective opinion – is that Hoka hasn’t gone and copied the traditional ‘stability’ shoe format. While the Constant’s marketing plug highlights it’s ‘support’ character, the ultimate ride result is what we would equate with a neutral behavior. More like support in a literal sense of the word, which is exactly what Hoka says the shoe is all about. It has the trademark cushioning which Hokas are known for, but when compared to a single density Bondi or the dual density Vanquish/Conquest, the midsole delivers its ride with a noticeable degree of difference. And this takes care of a typical lament associated with this brand; the ability of a (new) shoe model to sufficiently distinguish itself from others. A firmer RMAT foam below a softer EVA layering. Let’s round up the common Hoka traits to begin with. The Constant is very cushioned, a result which is a combination of a softer EVA top base and a firmer midsole base which Hoka likes to call the RMAT. 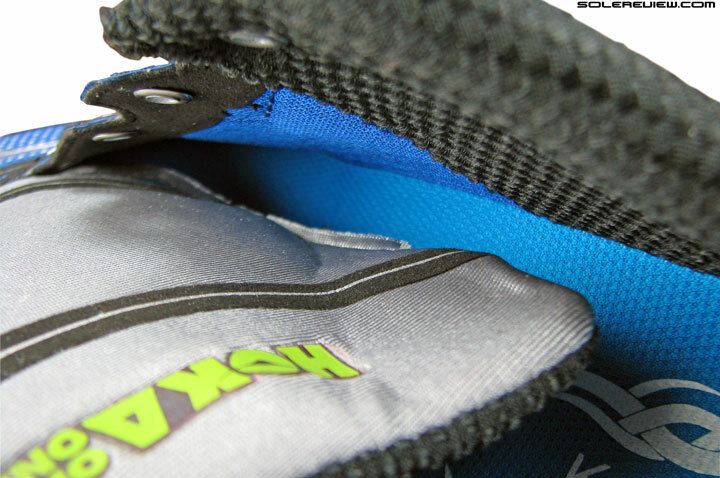 This foam, if you remember, formed the entire bulk of Huaka’s midsole, making the ride much firmer. When compared to other maximals such as the Bondi or Conquest, the cushioning feels a bit shallow. Ok, the stack heights count, but the soft over firm layering of the midsole produces a cushioning sensation of lesser depth than a Bondi, which is single density throughout – and thicker. Or even the Conquest/Vanquish, which uses a firm over soft stack – quite the reverse of the Constant. 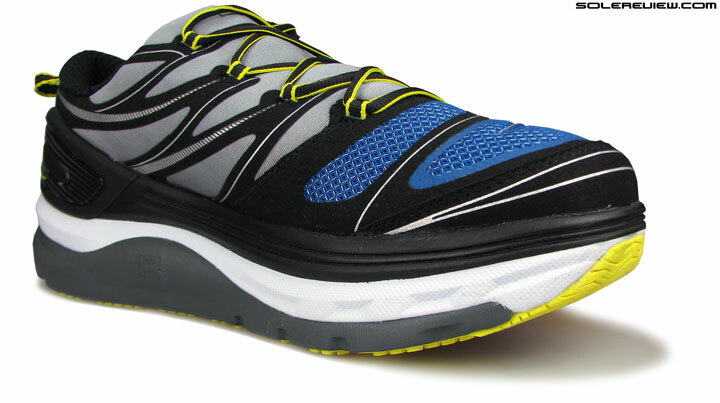 Naturally, responsiveness levels are different from what you get on other mainstream Hoka’s. The RMAT is responsive, yes, but you only access that once you go through the softer EVA layering. In short, the Constant feels more soft than responsive, in relative degree to the Bondi, Clifton or Vanquish/Conquest. If the upper doesn’t flail around, then yes, you can use the optional Ortho-pancake. And what if you used the much thinner Ortholite insole? It does give you easier access to the RMAT, increasing the feedback, but then, you have to deal with the likely negative consequences on upper fit. Not very rockered, toe spring is very traditional shoe like. Subdued heel spring, except for a bit of upwards bevel. The other noteworthy thing about the Constant is that it’s midsole isn’t as rockered, though the lateral heel has a visibly noticeable bevel. The heel and toe spring have the look and function of non-Hoka’s, and when combined with the soft ride and wider (intentional) outsole footprint, the transition quality is influenced. Wider base, and a teardrop shaped cavity keeps the foot centered. For forefoot strikers, this isn’t of as much import, but for runners who load from heel to toe, the Constant feels slightly sluggish when put in a ring against Hokas with prominently rockered designs. Models such as the Conquest and Clifton allow swifter transitions, helped both by its midsole composition and rockered ends. Regardless of how you footstrike, one will find the Constant to be slightly less economical than some of the other Hoka models you might have run in. As a standalone product, the Constant is far from being soggy and slow. 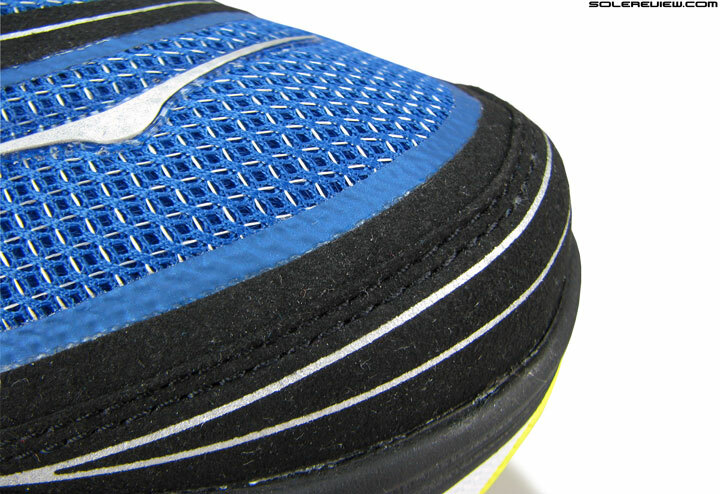 It is well cushioned, with a slightly softer sensation felt immediately under the foot vs. a Vanquish/Conquest/Bondi. Great for long runs, as all Hoka’s are, and the supportive nature of the midsole is distinctly underscored. And we haven’t talked about that (stability) part yet, so here it comes. When the word ‘stability’ is part of a running shoe’s description set, most would associate it with the midsole’s ability to ‘control’ foot gait, employing all manners of tricks to have your foot roll in a certain way. The wide forefoot print, coupled with a soft core and lowered toe spring, makes transitions relatively slow. The forefoot is also super inflexible. The Constant doesn’t do any of that. 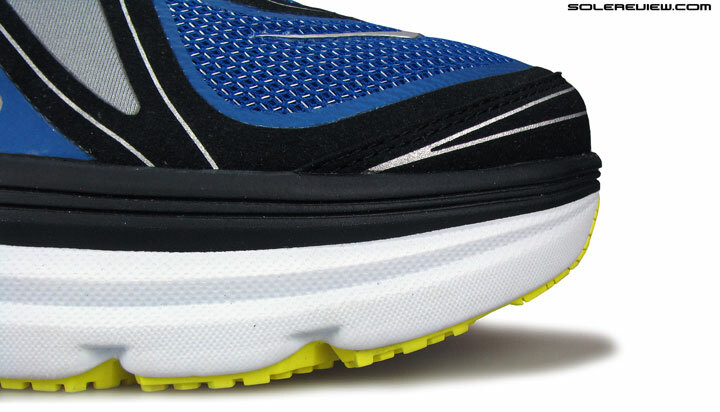 The midsole stacking is quite unique from a Hoka standpoint; a firmer grey RMAT cups the upper layer on either sides under the heel and midfoot. In the forefoot region, the grey foam only supports the medial side of the foot. The firmer RMAT flares out and up below the midfoot, creating the sense of greater arch support. What you get out of this is two pronged; first being a sense of a higher under-arch support, a byproduct of the firmer (grey) foam. Secondly, the supportive design of the heel and midfoot makes the shoe stable, which also works together with the lowered heel and toe spring. (the gap between the surface and midsole curve). The grey foam is molded a bit outwards medially (reminds us of the Brooks Transcend), which also lends a supportive feel. 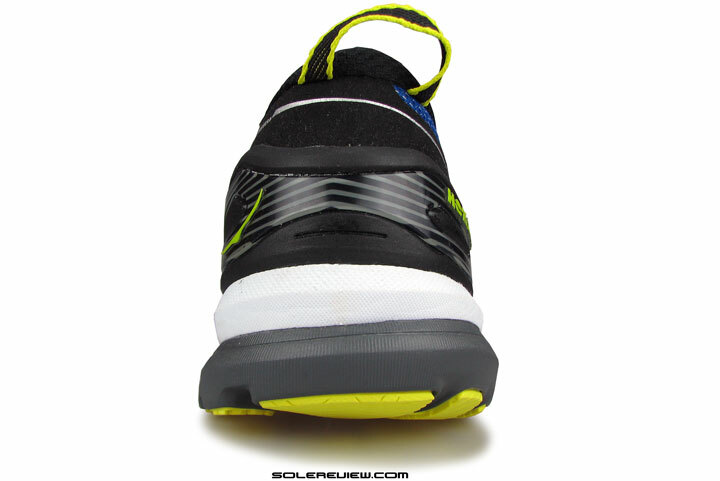 In the forefoot, the wider span and super rigidity (doesn’t flex at all) of the midsole add to the stable overtone. The molded TPU heel counter insert is glued to a foam base. The ‘activeframe’ construction cups the foot from heel to midfoot. The Constant also features the standard Hoka activeframe midsole, which happens to be the upper portion of the midsole cupping the foot by means of raised sidewalls. This is connected to the heel counter, and gradually tapers down in the direction of the midfoot. Looks heavy, but not heavy. A respectable 11.7 Oz/323 grams for a US 11 half pair. There isn’t any lateral (outer) lean for heel/rearfoot strikers. The shoe exhibits a tracking demeanor which happens to be straight and neutral; no funny motion control business here. We must also mention that the heavy aesthetic of the Constant does not necessarily convert into actual physical bulk. This is pretty lightweight for what it is; at 11.7 Oz/323 gms, this is at par with the Bondi 4, and lighter than the Vanquish. One drawback of the alternating grey-and-white layering is outsole wear. Under the forefoot, rubber coverage is limited to the boundaries, leaving a lot of the traction responsibilities to the exposed grey-white foam set-up. Since the grey foam is firm and white is soft, you’ll start seeing uneven outsole wear. The white foam starts shredding much faster than the grey RMAT, lowering that side slightly. 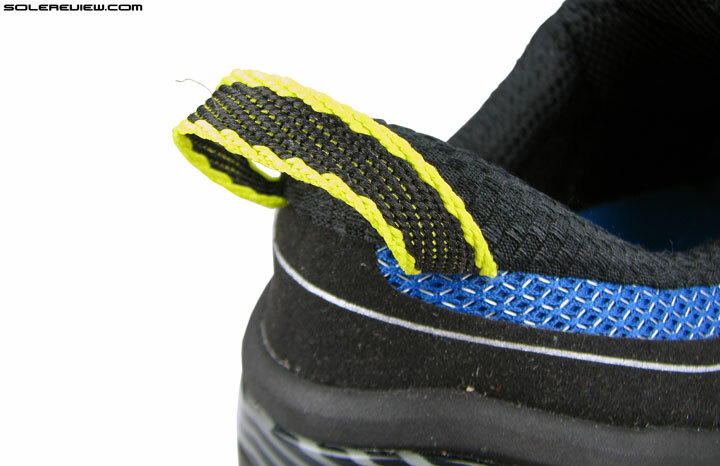 To add, the entire lateral forefoot is relatively unprotected, with thinner rubber strips and use of exposed foam pods. In the end, the Hoka Constant is a mixed bag of tricks. There are certain aspects of the shoe which people will find value in, like the roomy forefoot (a Hoka outlier) and the comfortable, supportive ride. Lacunae like an upper fit which feels like a work in progress, uneven forefoot outsole wear, and the high cost of ownership ($160? Come on!) can be potential turn-offs for many. 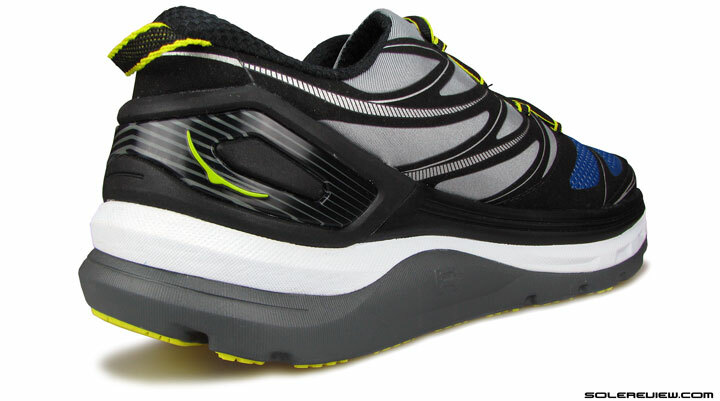 Buy the Hoka Constant only for two things – the spacious upper and the supportive, cushioned ride. For everything else which needs to be categorized as either good or bad – that’s a filtering process meant to be done by your subjective, running shoe barometer. Great review, and one I was looking forward to as I was interested in purchasing a pair of these shoes. I’ve been wearing the Hoka brand for 3 years now with good success. I would not want to be loosely strapped into one of these high platform shoes. That’s an ankle sprain waiting to happen. I see lots of complaints of Hoka narrow fit, but I think that may be intentional. You really need to keep centered over that massively thick foam midsole. I’m totally baffled by the design decision to go with the burrito tongue and minimal lacing. How many running shoes were ever successful with that sort of design??? 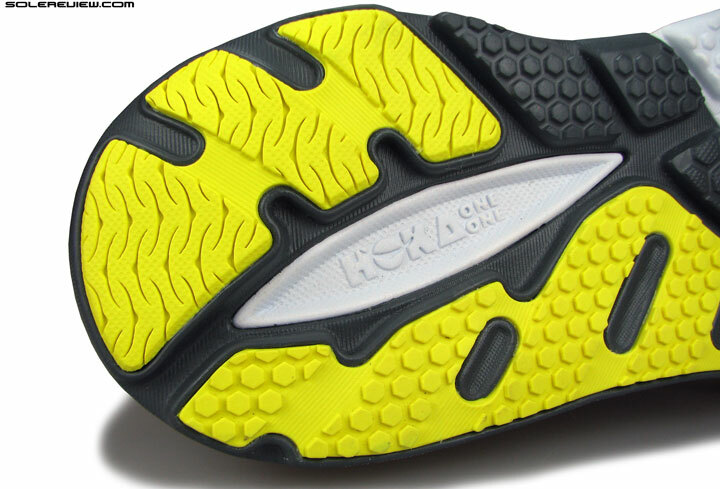 The recent Hoka trend to scale back the outsole to expose raw EVA is another turn-off. A savings of a fraction of an ounce for a serious durability issue is not a good trade-off. The now released “Speedgoat” has essentially full coverage Vibram outsole. Hopefully this is a reversal of the marshmellow outsole approach. Thank you for feedback. Haven’t tested the Speedgoat, we’ll hopefully get to it one day when we begging reviewing trail running shoes. 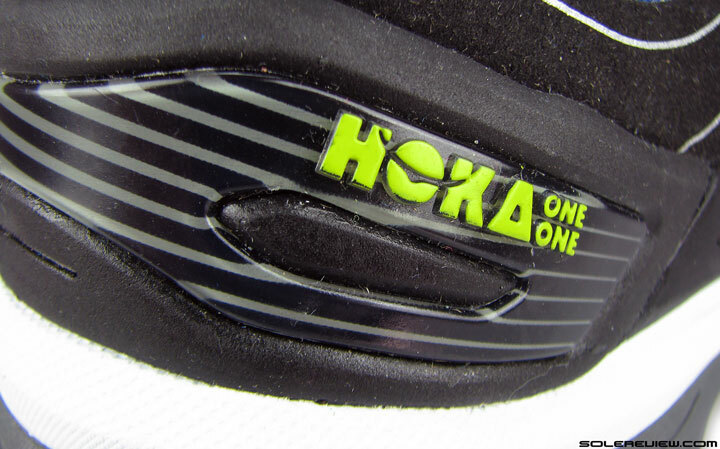 On a related note, we did mention (in our Clifton Review) on Hoka’s trail running roots influencing the upper fit. 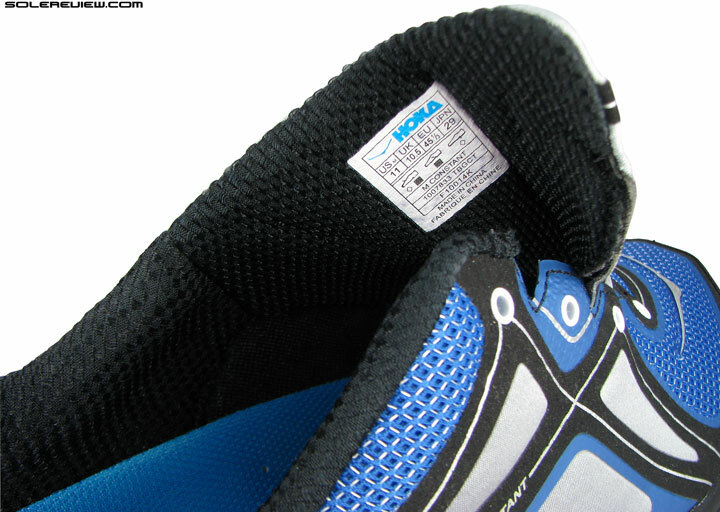 However, on roads, Hoka needs to take a good look at how their uppers spread wrap pressure. With Hoka uppers, our lament is not so much of overall narrowness. The upper tends to exert pressure points in certain areas, instead of being tight evenly like how adidas is – which is ok. So a local running store had a “Hoka Demo” coinciding with the club run which meets at the store. They had Constant demos in my size (US11.5). So I have ’em a spin. About 3 miles. Nice ride! I did not have issue with getting strapped into these shoes. The left side loosened up a bit once, and a little tightening solved that. We ran on sidewalks, including 90 degree turns in narrow spots. No instability issue making the turns. A significantly firmer ride than the Bondi or Stinson. But not unpleasant. I very much enjoyed running in them. I would still rather not have the burrito design. My major complaint is that I think it limits the shoes ability to breathe. 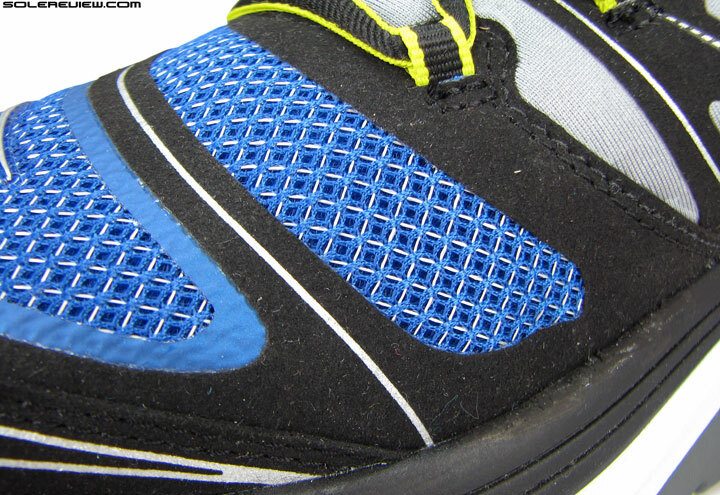 The only section of the shoe which is any sort of open mesh is over the toes. My feet were cooking. The heel counter is an improvement over the one used on the Bondi. The Bondi uses a stiff plastic outer heel counter which arches up onto the back of the achilles. 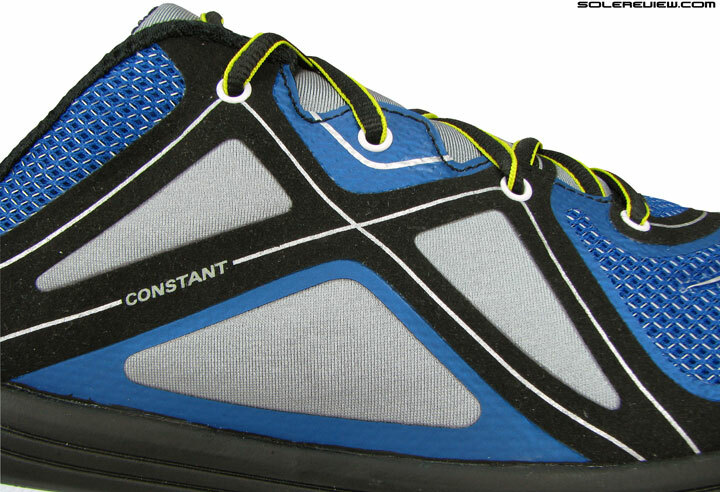 The Constant’s design has a nice big notch over the achilles, and about 10 cm less rise than the Bondi. I think those with sensitive achilles will appreciate this. A pair of the Constants followed me home! Thanks for the detailed report, we have a similar read on the Constant. It would be great to see some feedback on long term durability, since that area is currently a limitation of our reviews. Regarding the EVA stuff on the outsole, I am beginning to understand Hoka’s point (despite my harsh criticism peratining to outsole wear). Recently, I spent two weeks on the Britanny coast in France and as shoes of choice I took with me my Bondi 4s, Clifton 1s, and Adios 2 Non-Boost (as reference for a classic rubber outsole). All I can say is that although running with them is an issue for me (knees and hips – ouch) both the Bondis and Cliftons absolutely excelled as holiday shoes – even barefoot. As you might have heard or read, the Britanny coast tends to be rather rocky and particularly on wettish and drying rocks both pairs would still stick as if almost glued on. Not on fresh wet rocks, however. I did a bit of comparative testing with the Adios and that proved to be a rather bad idea. Crash helmet and full American football attire would have been called for – i.e. virtually no grip at all. As far as reports about using them on trails is concerned, I do believe every word !!! 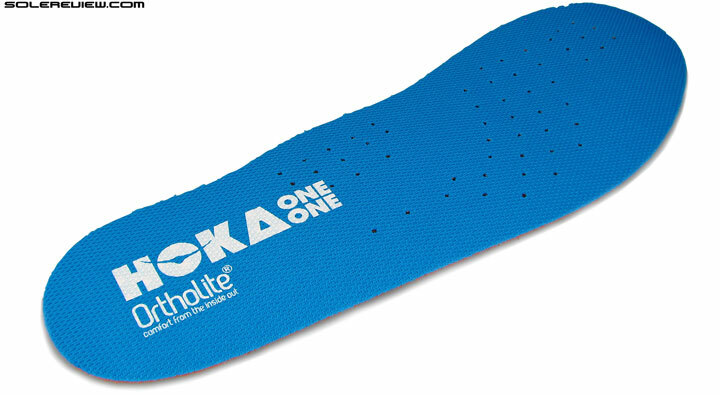 Apart from that, the strap / loop at the heel proved rather useful indeed while dipping your feet in the sea – so now you know what they are there for 😉 – don’t forget that Hoka is French and France does have a considerable amount of coastline ;-). As far as the Bondi 4s and Clifton 1s are concerned both are absolutely lovely for long (!!!) walks – even though I cannot really run in them (for that I use my Stinson Lites (10 kms – so far I am happy and grateful that things work but I have not yet abandoned the idea of 20 km or more – the good thing about 10 km is that I do not need to worry about taking things with me – have two glasses of energy drink stuff before followed by a good pee half an hour later and I am set to go and fine)). Regarding walking, (as you know by now ;-)) I live in Frankfurt am Main in Germany and as it happens less than 50 metres from the Frankfurt route towards Santiago de Compostela (you know, the ‘Camino’). If I follow the route towards the city centre, I go towards Santiago and if I go in the opposite direction I could walk all the way to Kiev. It is known as the ‘Via Regia’. Anyway, should I ever endeavour to do the Camino, both the Bondi 4s and the Cliftons would be very much at the top of my list of shoes of choice. Anyway, have a wonderful rest of the weekend. I almost forgot. The criticism as far grip on wet ground is concerned also applies to my Stinson Lites (they also have a proper rubber outsole) although I did not test them in France. Take your pair of Bondi 4s and Clifton 1s and try them out on wet ground – i.e. twist them sideways. Try that and you should understand what I meant in terms of grip. 🙂 I’ve learned so much from y’all. Thank you! Yes, the lacing is really off on this one, and there is only so much you can do! Thanks for the feedback. The reviews on here are the most detailed out there, so i use this site to choose my new shoes. One small thing i noticed tho was that the full image of the shoe you are reviewing is often somewhere halfway along or at the bottom of the review, whereas i think it should start with it. Interesting insight, thanks! For most of our reviews, we usually put the side shot image within the set of first four, we changed it a bit this time around. The comments/Q&A thread will be closed till January 17, 2016. Any inconvenience is regretted. Premium access members can continue to use their dedicated comment section.